Cryptococcus neoformans causes a life-threatening meningoencephalitis in a significant percentage of AIDS patients. Mice immunized with a glycoconjugate vaccine composed of the glucuronoxylomannan (GXM) component of the cryptococcal capsular polysaccharide conjugated to tetanus toxoid (TT) produce Abs that, based on the epitope recognized, can be either protective or nonprotective. Since nonprotective Abs block the efficacy of protective Abs, we are interested in developing a vaccine that would focus the immune response specifically to protective epitopes. Previously, we screened a phage display library with 2H1, a protective anti-GXM mAb, and isolated PA1, a representative peptide that had a Kd of 295 nM for 2H1. Mice immunized with PA1 conjugated to keyhole limpet hemocyanin developed high anti-peptide (1/13,000), but low anti-GXM (maximum, 1/200) titers. We now report our efforts to improve this vaccine by screening a sublibrary with six random amino acids added to either end of the PA1 motif to identify higher affinity peptides. P206.1, a peptide isolated from this sublibrary, had 80-fold higher affinity for 2H1 (Kd = 3.7 nM) than PA1. P206.1 bound protective, but not nonprotective, anti-GXM Abs. Mice immunized with P206.1 conjugated to various carriers did not mount an Ab response to GXM despite developing high anti-peptide titers. However, mice primed with GXM-TT and boosted with P206.1-TT developed significant anti-GXM titers (maximum, 1/180,000). This latter immunization scheme focused the immune response on protective epitopes, since only 2–5% of these titers were directed against nonprotective de-O-acetylated GXM epitopes compared with 20–60% in animals primed and boosted with GXM-TT. Organisms that possess a polysaccharide capsule, such as Streptococcus pneumoniae, Hemophilus influenzae type B, Neisseria meningitidis, group B streptococcus, and Cryptococcus neoformans, are responsible for a majority of serious infections and for most deaths from meningitis (1). While purified capsular polysaccharide vaccines of S. pneumoniae and N. meningitidis can prevent infection with homologous serotypes (reviewed in Ref. 2), these vaccines are not effective in protecting the most susceptible individuals, namely infants, people over age 65 yr, and those with impaired immunity. Polysaccharides by themselves are poorly immunogenic and typically induce a T-independent response lacking immunologic memory (3, 4). Currently, the most effective vaccines against encapsulated organisms use capsular polysaccharides conjugated to an immunogenic protein carrier, such as tetanus toxoid (TT),6 and can generate a T cell-dependent response to polysaccharide Ags (4, 5, 6, 7, 8). However, these glycoconjugate vaccines contain multiple epitopes, and there is evidence that Abs directed against some capsular epitopes can block the efficacy of protective Abs and even enhance infection (9, 10, 11, 12, 13, 14). Also, glycoconjugates may not be sufficiently immunogenic in elderly and immunosuppressed individuals (reviewed in Ref. 15). C. neoformans is an encapsulated yeast that causes a life-threatening meningoencephalitis in a significant number of AIDS patients in the U.S. and as many as 30% of HIV-infected people in Africa (16, 17, 18). The mortality rate of acute cryptococcal meningitis is 10–20% (19, 20), and those patients who survive must be maintained on life-long anti-fungal therapy. mAbs against the glucuronoxylomannan (GXM) component of the capsular polysaccharide can protect mice against infection with C. neoformans (21). However, infection with C. neoformans and immunization with GXM conjugated to tetanus toxoid (GXM-TT) induce both protective and nonprotective Abs (12, 22, 23). These different types of Abs bind to distinct epitopes on GXM (12, 24). This has led us to define protective and nonprotective epitopes on GXM based on their ability to bind mAbs that do or do not prolong the life of mice lethally infected with C. neoformans. Nonprotective Abs can block the efficacy of protective Abs, providing an explanation for why polyclonal immune serum from GXM-TT-immunized mice does not protect against infection (21, 22, 25). These results suggest that a vaccine that directs the immune response specifically against a protective epitope, thereby eliciting only protective Abs, would be more effective than a vaccine consisting of all the capsular epitopes. Since oligosaccharides that can bind to anti-GXM Abs have not been identified, we have previously sought to create an effective vaccine by identifying a peptide mimic of a protective epitope of GXM. We have screened phage peptide libraries with 2H1, one of our most protective anti-GXM mAbs (26, 27). 2H1 is encoded by the VH7183 and Vκ5.1 genes that dominate the murine Ab response to GXM (28). In these earlier studies we identified several peptides that were mimetics of GXM (Table I⇓) in that they competed for 2H1 binding to GXM. However, these peptides were not mimotopes of GXM, since immunization with three representative peptides conjugated to keyhole limpet hemocyanin (KLH) did not induce significant anti-GXM titers (27). Crystal structure analysis revealed that the carboxyl-terminal portion of PA1 was not effectively engaging the H chain portion of the 2H1 Ag binding pocket (29). We postulated that if we could improve the fit of the peptide to the 2H1 H chain complementarity-determining regions (CDRs), we would be able to elicit a better 2H1-like response. One possible way to identify such peptides with a better fit to the protective Ab was to screen libraries for peptides that bound 2H1 with a higher affinity. We therefore designed a new peptide library using the PA1 core motif with six random amino acids added to both the carboxyl- and amino-terminal ends. From this evolutionary sublibrary we identified a peptide (P206.1) with 80-fold higher affinity for 2H1 than PA1. Mice immunized with P206.1 did not generate high titers against GXM. However, mice primed with a low dose of GXM-TT and then boosted with P206.1-TT produced significant levels of Abs directed at a protective epitope of GXM. The L200 library was created by inserting a modified version of the PA1 motif between the SfiI sites of the vector fUSE5, located at the amino-terminal part of the pIII coat protein giving the final amino acid sequence H2N-ADVA X6 TPXW[M/L][M/L] X6 AAG-g3p (30, 31). Briefly, 24 pmol of the oligonucleotide 5′-TATATAG GCC GAC GTG GCC [NNK]6 ACA CCT NNK TGG MTG MTG [NNK]6 NNG GCC GCT GGG GCCTTATTA (Genset, San Diego, CA) was amplified by PCR using Taq polymerase and two short biotinylated oligonucleotides, biotin-5′-TATATAGGCCGACGTGGCC and biotin-5′-TAATAAGGCCCCAGCGGCC (100 pmol each, in a final volume of 100 μl). After 10 cycles (94°C for 30 s/56°C for 60 s/72°C for 60 s), the resulting mixture was purified by filtration over a 10-kDa Minicon (Amicon, Beverly, MA), digested with SfiI, and incubated with streptavidin-coated beads to remove the cut ends. After phenol/chloroform purification and concentration over a 10-kDa Minicon, the resulting 67-base insert was ligated to 500 ng of SfiI-cut fUSE5 vector (26, 32) in a 4:1 ratio. A library of 186 million clones was generated after 10 electroporations into the bacterial strain MC1061, of which 6.5% (12 million) gave a positive signal with mAb 2H1 as detected by direct lift assay on bacterial colonies (for details on phage library amplification and lift assay see Ref. 26). Random sequencing of 10 clones of the original L200 library (data not shown) revealed correct insertion of the degenerated oligonucleotide and an over-representation of methionine residues vs leucine residues in the two degenerate positions, M/L. 2H1-binding phage were isolated by successive cycles of selection and purification by incubation with 2H1 Fab. Fabs were made using the ImmunoPure Fab preparation kit from Pierce (Rockford, IL). For each round, between 5 × 105 and 1 ×109 transducing units were incubated with decreasing amounts of 2H1 Fab for 24 h at 37°C in a final volume of 100 μl. Phage-2H1 complexes were captured by biotinylated anti-mouse κ L chain (Southern Biotechnology Associates, Birmingham, AL) bound to streptavidin-coated magnetic beads (Dynal Biotech, Lake Success, NY), prepared as previously described (26). For the initial screen, the capture time was 2 min, and 50 μl of beads were used per incubation. Phage yields were calculated for each capture; the incubation giving the lowest yield >1% was chosen for the next round. A total of six rounds of selection with decreasing amounts of mAb 2H1 were performed. Peptide sequences were inferred from DNA sequences of selected phage as previously described (26). Peptides PA1, P206.1, P206N, and P206C (Table II⇓) and their biotinylated counterparts were synthesized by the Proteomics Facility at Albert Einstein College of Medicine. Peptide preparations were analyzed by HPLC and mass spectroscopy. Control peptide P315 was a gift from Dr. S. Nathenson (Albert Einstein College of Medicine). P206.1-multiple antigenic peptide (P206.1-MAP) was also prepared in the Proteomics Facility using solid phase methodology on an ABI 433A peptide synthesizer (PE Applied Biosystems, Foster City, CA) in 0.1 mmol scale using F-moc chemistry. The F-moc 4 branch-MAP resin was purchased from Advance ChemTech (Louisville, KY), and all other reagents were purchased from PE Applied Biosystems. Peptide resin was cleaved and deprotected by a mixture of trifluoroacetic acid-thioanisole-1,2-ethanedithiol phenol-water for 2 h. Peptides were precipitated by methyl-tert-butyl ether and washed. All mAb used in this study have been reported previously (28). The reactivity of the peptides to several different anti-GXM mAbs was analyzed by incubating 1 μg/ml mAb with biotinylated peptide (1 μg/ml) bound to streptavidin-coated (1 μg/ml) ELISA plates. Binding of mAbs was detected with anti-mouse κ L chain Abs conjugated to alkaline phosphatase. ELISA plates were developed with 1 mg/ml p-nitrophenyl phosphate (Sigma-Aldrich, St. Louis, MO) in 1 M diethanolamine and 0.25 mM MgCl2, pH 9.8, and the absorbance was measured at 405 nm. Competition ELISAs were performed by first incubating anti-GXM Abs or serum from immunized mice with different concentrations of peptide for 2 h at 37°C. Samples were then transferred to a GXM-coated plate, and binding was detected as described above. Anti-GXM serum titer was determined by ELISA. Plates were coated with 10 μg/ml of GXM prepared from C. neoformans serotype A, strain NIH 371. The GXM was a gift from A. Casadevall (Albert Einstein College of Medicine); it was prepared by cetyltrimethylammonium bromide precipitation and did not contain detectable protein contaminants. O-acetyl groups were chemically removed from GXM prepared from C. neoformans serotype D, American Type Culture Collection strain 24067 by treatment with NH4OH (33). Serum samples were first treated with 100 mM 2-ME to inactivate IgM. Sera were then incubated in serial dilutions starting at 1/25 or 1/50. GXM binding was then detected as described above with either a mixture of alkaline phosphatase-conjugated anti-mouse IgG isotypes (Southern Biotechnology Associates) or Abs to each individual isotype. P206.1 cross-reactivity with anti-GXM titers was determined by first incubating sera with 0.01, 0.1, or 1 mg/ml P206.1 at 37°C for 1 h and then determining the anti-GXM titer as described above. In all cases a dilution was considered positive when the OD observed was 3 times greater than background. The presence of Abs against the various peptides was similarly determined by screening mouse sera on biotinylated peptide (10 μg/ml) bound to streptavidin-coated (10 μg/ml) plates. The kinetics of the interaction between 2H1 Fab and P206.1 were measured by optical sensor (Iasys; Fisons, Cambridge, U.K.). Biotinylated cuvettes (Fisons) were coated with streptavidin in PBS/0.05% Tween 20 until saturated. Biotinylated peptides (PA1, P206.1, P206C, or P206N) were then added at a concentration of 1 μM in PBS/0.05% Tween 20 and allowed to saturate the cuvette. Various concentrations of 2H1 Fab, ranging from 5–1000 nM, were added and allowed to bind. Cuvettes were regenerated using 10 mM HCl for 30 s. Curves were generated with Iasys software using two-phase association and dissociation protocols from which the equilibrium dissociation constant (Kd) was calculated. Peptides (1 mg) were conjugated to TT (3 mg; Connaught, Swiftwater, PA) in 0.25 ml of PBS, pH 7.5, with the slow addition of 120 μl of 5% glutaraldehyde. The conjugate was dialyzed at 4°C against sterile PBS for 3 days with daily changes. Six-week-old BALB/c mice (5–10 in each group) were immunized by i.p. injection with 100 μg of each peptide conjugate or 0.5 μg of GXM-TT (gift from J. Robbins, National Institutes of Health, Bethesda, MD) in emulsion with CFA on day 0 and with IFA on day 28. Mice were bled before the first immunization and on days 14 and 42 postimmunization. Data were analyzed with StatView statistical software (SAS Institute, Cary, NC). ELISA data were compared using the Mann-Whitney U test for nonparametric data. A p < 0.05 was considered statistically significant. To identify peptides that would engage the 2H1 H chain CDRs more effectively, we created an evolutionary sublibrary of PA1 using a six-amino acid core peptide of the PA1 motif (TPXW[M/L][M/L]) that was degenerate at residue 3 and had either methionine or leucine at the fifth and sixth positions. Six random amino acids were added to either end of the core motif (Fig. 1⇓). This L200 library was subjected to six rounds of screening with progressively decreasing amounts of 2H1 mAb. Random phage clones were sequenced from each screen. Table III⇓ shows the amino acid sequences from eight random phage clones (P206.1–6, P206.8, and P206.11) isolated from the sixth and last phage screen. In this final screen, the motifs represented by P206.1 and P206.6 were each identified in three different clones. By ELISA, both motifs gave stronger reactions than PA1, suggesting that they were binding 2H1 with a higher affinity. The motif represented by P206.6 was present in the second, fourth, and fifth rounds, while the motif represented by P206.1 appeared for the first time in this last screen. Since it required six rounds of screening to focus the library on P206.1, this peptide was synthesized for further analysis. The influence of amino acids on either side of the core motif on the overall structure of the peptide and its interaction with the Ab was difficult to predict. To examine whether both amino- and carboxyl-terminal end randomization was necessary for the higher binding to the 2H1 mAb and to study the roles of these additional sequences, peptides were synthesized that retained the core motif and had in addition either the amino-terminal (P206N, Table II⇑) or carboxyl-terminal six amino acids (P206C, Table II⇑) of P206.1. Diagram depicting the construction of the evolutionary phage peptide library. The L200 library was created by introducing a 67-base oligonucleotide into the SfiI sites of the pIII protein (indicated by gray lettering) in the fUSE5 vector. The oligonucleotide coded for a degenerate PA1 motif (TPXW[M/L][M/L]), indicated in bold, and six random amino acids on either side of this motif. ELISA data showed that 2H1 Fab bound to P206.1 ∼100-fold more strongly than to PA1 (Fig. 2⇓A). Competition ELISA (Fig. 2⇓B) revealed that these new peptides inhibited the binding of 2H1 Fab to GXM with an ID50 of 0.4 μM for P206.1, 1.2 μM for P206N, and 12 μM for P206C compared with an ID50 of 45 μM for PA1, which was very close to the PA1 ID50 of 35 μM previously reported (26). These peptides competed in a similar fashion with the binding of 2H1 to P206.1 (Fig. 2⇓C). In addition, all three peptides blocked 2H1 binding to PA1 (data not shown). The control peptide P315 had no effect on 2H1 Fab binding to GXM (Fig. 2⇓B), P206.1 (Fig. 2⇓C), or PA1 (data not shown) at concentrations as high as 2.5 mM. P206.1 binds with high affinity to 2H1, the anti-GXM mAb used to screen the peptide library, and inhibits 2H1 binding to GXM. A, 2H1 Fab binding to PA1- or P206.1-coated ELISA plates. B and C, Competition of 2H1 Fab binding to GXM (B) and P206.1 (C) by peptides P206.1, P206C, P206N, and PA1 and the control peptide P315. GXM ELISA plates were prepared by coating with 10 μg/ml of GXM prepared from C. neoformans. Peptide ELISA plates were prepared by coating first with streptavidin (1 μg/ml), followed by biotinylated peptide (1 μg/ml). 2H1 Fab binding was detected with anti-mouse κ L chain Abs conjugated to alkaline phosphatase. Competition ELISAs were performed by first incubating 2H1 Fab with different concentrations of peptide for 2 h at 37°C. We used an optical sensor (Iasys) to determine the affinity of P206.1 and its related peptides for 2H1. For all peptides, the binding interaction with 2H1 Fab was biphasic and time dependent. The Kd of 2H1 for PA1 has been previously reported to be 295 nM as measured by BIAcore (Uppsala, Sweden) (26). We found a similar Kd as measured by Iasys (320 nM). The Kd for 2H1 was estimated at 3.8 nM for P206.1, 8.1 nM for P206N, and 210 nM for P206C (Fig. 3⇓ and Table IV⇓). This data confirmed that the amino-terminal amino acids are essential for the high affinity of P206.1 for 2H1, whereas the carboxyl-terminal amino acids are less important in this regard. The affinities of peptides to the selecting Ab (2H1), as measured by biosensor. Binding of 2H1 Fab to cuvettes coated with P206.1, P206N, or P206C was performed. After establishing a baseline, 100 nM 2H1 Fab was added at 75 s. Cuvettes were washed with PBS, and dissociation was followed, starting at 420 s (arrow). We compared the binding of several closely related anti-GXM mAbs (28) to the different peptides by ELISA. 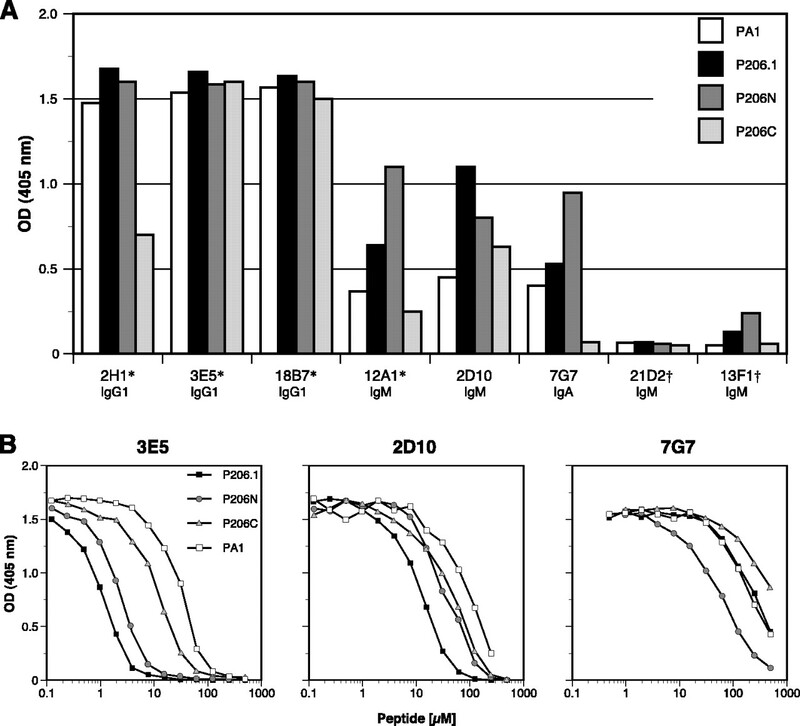 Compared with PA1, P206.1 bound more strongly than PA1 to most of the mAbs tested. The binding of the various peptides to some mAbs is shown in Fig. 4⇓A. P206.1 binds well to all mAbs known to be protective against C. neoformans infection in a passive immunization model (i.e., 2H1, 3E5, 18B7, and 12A1) (34, 35, 36) and does not bind to the nonprotective Abs 13F1 and 21D2 (22, 25). We tested peptide binding to several other mAbs to GXM not shown in Fig. 4⇓. 2D10 and 7G7 are shown, as they were representative of peptide binding patterns seen with other IgM and IgA mAbs to GXM; the difference in binding seen between these mAbs and 2H1, 3E5, and 18B7 (all IgG1) may represent differences in fine specificity, avidity, or both. P206N binds as well or better than P206.1 to most mAbs, while P206C binds less well than both P206.1 and PA1 to many of the mAbs. 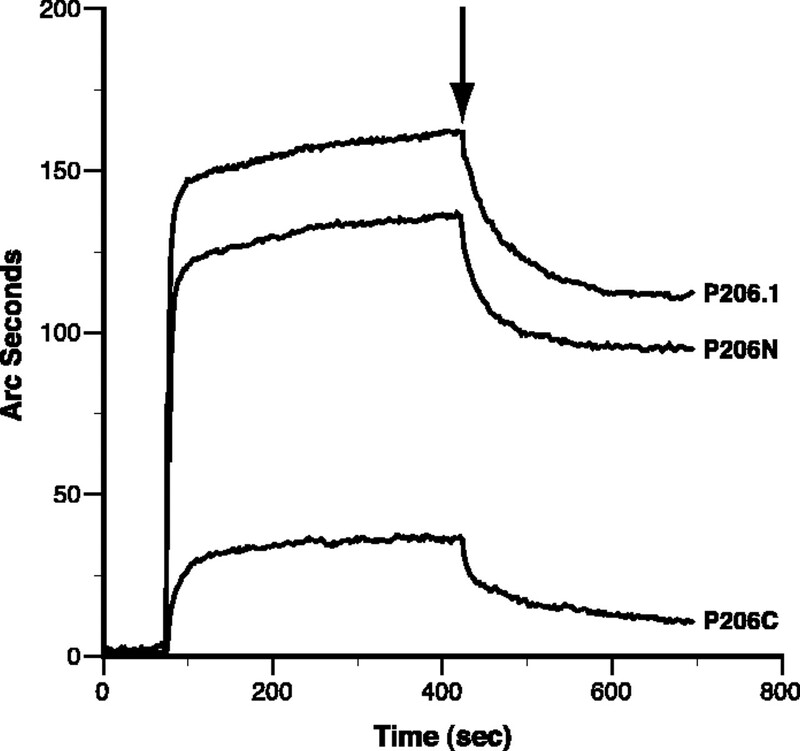 Neither P206N nor P206C binds to the nonprotective mAbs. Competition ELISAs between the peptides and the different mAbs were performed to confirm the binding data. A few of these inhibition studies are shown in Fig. 4⇓B. Although 3E5 binds to all the peptides, the competition data indicate that there is a difference in binding among these peptides, with ID50 values similar to those seen with 2H1 and ranging from 1.0 μM for P206.1 to 2.2 μM for P206N and 10.1 μM for P206C. While all these mAbs are encoded by VH7183 and Vκ5.1, the Abs assayed here differ from each other by a number of somatic point mutations in their CDRs, in particular within VH CDR2 (35), which has been shown to be critical for peptide binding (37). These amino acid differences probably contribute to the differences in binding characteristics of P206.1, P206N, and P206C presented in Fig. 4⇓A. These results indicate that while the amino-terminal, but not the carboxyl-terminal, extension promotes the broad specificity of P206.1, the amino acid sequence of the Ab binding region also contributes to the fine specificity for the peptides. P206.1 binds most mAbs to GXM, but does not bind to nonprotective mAbs. A, ELISA of peptides binding to various mAbs against GXM. Ab isotype is indicated directly below. ∗, mAbs known to protect mice in a passive immunization model of C. neoformans infection; †, mAbs known to be nonprotective. B, Examples of competition ELISAs with representative mAbs. ELISA plates were prepared by coating first with streptavidin, followed by biotinylated peptide. Next, 1 μg/ml mAb was incubated, and mAb binding was detected with anti-mouse κ L chain Abs conjugated to alkaline phosphatase. Competition ELISAs were performed by first incubating mAbs to GXM with different concentrations of peptide for 2 h at 37°C. We have previously reported that mice immunized with P601E or PA1 conjugated to KLH induced low (<1/200) or undetectable titers to GXM (27). In our current studies mice were immunized with P206.1 conjugated to several different carriers. Despite inducing significant Ab titers to the peptide (Fig. 5⇓A), neither P206.1 conjugated to TT nor P206.1 expressed as a tetrameric MAP was able to induce titers to GXM greater than those observed in mice immunized with TT alone. This suggested that despite its high affinity for 2H1 and its ability to block 2H1 binding to GXM, P206.1 is not a mimotope of GXM, since it does not elicit an immunological response to the native carbohydrate Ag. Antibody titers following immunization of mice with P206.1. A, Titers to GXM and P206.1 after the second immunization are indicated for TT alone, P206.1-TT, unconjugated P206.1, or P206.1 expressed on a MAP backbone. Mean anti-GXM titers were 1/150 (TT), 1/25 (P206.1-TT), 1/50 (P206.1), and 1/56 (P206.1-MAP). B, Anti-GXM and anti-peptide IgG titers induced after priming animals with a low dose (0.5 μg) of GXM-TT glycoconjugate on day 0 and boosting with various peptide conjugates on day 28. Anti-GXM titers following primary GXM-TT (GXM 1°) and secondary peptide (GXM 2°) immunizations are shown. Mean secondary anti-GXM titers were 1/29,000 (TT), 1/145,000 (P206.1-TT), 1/53,000 (P206.1), and 1/37,000 (P206.1-MAP). Statistical significance (p < 0.03) was observed between P206.1-TT and TT and P206.1-MAP. C, Competition ELISA with serum from the two mice with the highest anti-GXM titers indicated in B (denoted a and b). Anti-GXM titers were assayed after incubation with no inhibitor, P206.1 (1 mg/ml), or P315 (1 mg/ml). The loss of GXM binding activity after P206.1 inhibition revealed that the Abs to GXM cross-reacted with P206.1, but not with the irrelevant peptide P315. Nevertheless, since P206.1 does distinguish between protective and nonprotective Abs to GXM, we speculated that this peptide might specifically stimulate a response to a protective epitope on GXM if it encountered a population of memory B cells making Abs to both protective and nonprotective epitopes. To examine this possibility, we first immunized mice with a low dose of the GXM-TT conjugate and then boosted these mice with either P206.1 conjugated to various carriers or the peptide alone. Using this immunization scheme, the anti-GXM titers made in response to boosting with unconjugated peptide or P206.1-MAP were no different from the response to boosting with TT alone (Fig. 5⇑B). However, boosting with P206.1-TT induced significant titers to GXM (1/50,000 to 1/280,000), which are very high for an anti-carbohydrate response (GXM 2°, Fig. 5⇑B). None of these animals developed significant titers to GXM after the primary immunization with GXM-TT (GXM 1°, Fig. 5⇑B), indicating that the GXM-specific Abs were activated in response to P206.1 immunization. Furthermore, the anti-peptide titers to P206.1 observed following the single peptide immunization of the GXM-primed mice were similar to the titers to GXM and higher than those seen in a primary response to P206.1-TT (Fig. 5⇑B). As expected from this finding, free P206.1 inhibited the binding of the serum Abs to GXM, while P315, an irrelevant peptide, did not (Fig. 5⇑C). These data further prove that the anti-P206.1 Abs were cross-reactive with GXM. The anti-GXM response induced by P206.1-TT was >90% IgG1 with small amounts of IgG2b, IgG2a, and IgG3, consistent with a secondary immune response (data not shown). While this was the first time we were able to induce a strong anti-carbohydrate response using P206.1, and this response was very good for a peptide mimotope for a carbohydrate Ag, the titers were significantly lower than the anti-GXM titers from other experiments in which animals were primed and boosted with the GXM-TT conjugate (average of 1/1,000,000; data not shown). We conclude that after priming with the glycoconjugate and boosting with the peptide conjugated to TT, P206.1 behaved like a mimotope of GXM. Protective mAbs 2H1, 3E5, 18B7, and 12A1 do not react with de-O-acetylated GXM, while most nonprotective mAbs do (38) (data not shown). 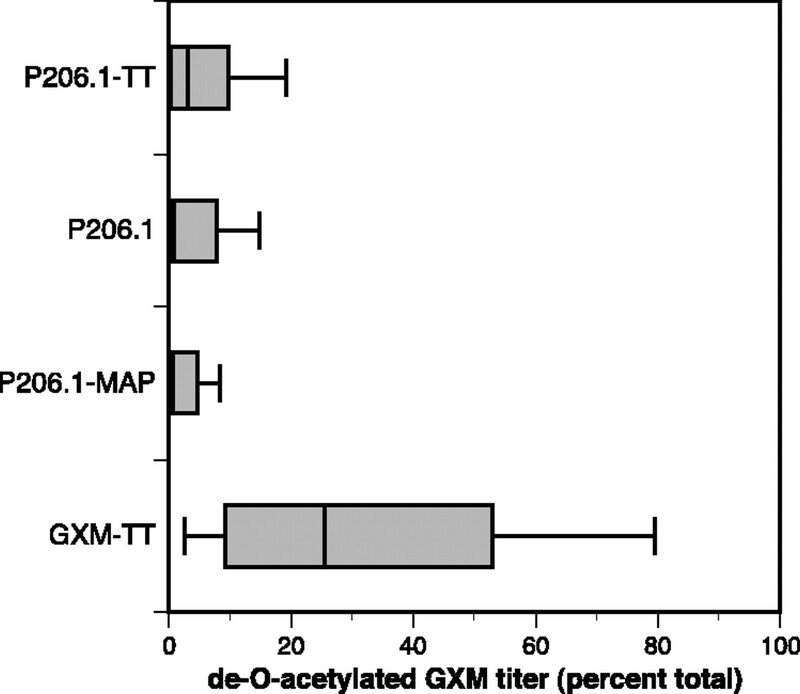 About 5% of the Abs elicited by priming with GXM-TT and boosting with P206.1-TT reacted with de-O-acetylated GXM (Fig. 6⇓). This is compared with other experiments in which 20–60% of the GXM Abs from animals primed and boosted with GXM-TT reacted with de-O-acetylated GXM (Fig. 6⇓). While we cannot be sure that all the Abs that bind de-O-acetylated GXM are nonprotective, it is clear that P206.1 directed the immune response away from de-O-acetylated epitopes. Immunization with P206.1 directed the immune response away from nonprotective epitopes on GXM. Shown is a box plot indicating the percentage of total anti-GXM IgG Abs binding to de-O-acetylated GXM. Titers to de-O-acetylated GXM were determined by ELISA using plates coated with GXM treated with NH4OH to remove O-acetyl groups. The titer to de-O-acetylated GXM was then divided by the titer to native GXM to yield the percent total titer to de-O-acetylated GXM. The median percent titer to de-O-acetylated GXM is indicated by the vertical line inside the gray boxes; the left and right boundaries of each box represent the 25th and 75th percentiles, respectively; the ends of the lines extending from the left and the right side of each box represent the 10th and 90th percentiles, respectively. Mean anti-de-O-acetylated GXM titers were 1/5,000 (P206.1-TT), 1/2,000 (P206.1-MAP), 1/1,600 (P206.1), and 1/105,000 (GXM-TT). Statistical significance (p < 0.01) was observed between the GXM-TT group and all other immunization groups. The GXM-TT glycoconjugate is a complex Ag that is highly immunogenic but induces both protective and nonprotective Abs (12, 23). The mouse Ab response to GXM-TT and to infection with C. neoformans is highly restricted in Ab V region gene usage to VH7183 and Vκ5.1 (28, 39, 40). The restricted nature of this response is similar to that reported for other polysaccharide Ags (41), suggesting that only a few B cells expressing this particular combination of V regions are responsible for the anti-GXM response. We hypothesized that screening phage libraries with the anti-GXM mAb 2H1 (VH7183, Vκ5.1) would identify a mimetic that would elicit anti-GXM Abs using the same V regions. However, while peptides PA1 and P601E, which were identified with 2H1, were mimetics of GXM, they did not stimulate significant Ab titers to GXM (27). The crystal structure of PA1 in the 2H1 Ag binding pocket revealed that compared with other peptides that had been cocrystallized with Abs, the carboxyl-terminal portion of PA1 does not fully engage the 2H1 H chain CDRs (29). These structural data were confirmed functionally by the finding that anti-peptide Abs made in response to P601E immunization used a very similar VL to 2H1, but used a different VH (27). We therefore turned again to the power of screening large peptide libraries to find a more effective peptide mimotope. We designed an evolutionary phage peptide library using the PA1 core motif as a fixed sequence and randomized extensions of that motif at both the carboxyl- and amino-terminal ends. We screened for a peptide that had higher affinity for 2H1 and isolated P206.1, which has 80-fold higher affinity than PA1 for the selecting mAb. Like PA1, P206.1 inhibits the binding of 2H1 to GXM and binds to all mAbs known to be protective in a passive immunization model, but does not bind to nonprotective anti-GXM mAbs. To better understand why P206.1 bound with a higher affinity than PA1 to the 2H1 Ag binding pocket, we created peptides similar to P206.1 that had either the carboxyl-terminal (P206C) or the amino-terminal (P206N) additions along with the core motif. In light of the data from the PA1/2H1 crystal structure and reports that H chain CDRs are the primary contributors to V region affinity (37), we expected that the carboxyl-terminal end of P206.1 would contribute to its higher affinity. However, our results indicate that the significant increase in affinity of P206.1 is mediated primarily by the amino-terminal amino acids, whereas the carboxyl-terminal amino acids are not important in this regard, since P206N had an affinity for 2H1 close to that of P206.1, while the affinity of P206C for 2H1 was similar to that of PA1. The additional amino-terminal amino acids are also primarily responsible for the ability of P206.1 to bind several different anti-GXM mAbs with a higher affinity than PA1. It is possible that the amino-terminal amino acids affect the way P206.1 folds into the 2H1 Ag binding site, thereby improving the fit of the peptide to the H chain CDRs. Alternatively, P206.1 may fold into the Ag binding site of 2H1 in a different conformation than PA1 or engage framework residues that border on the pocket. The only way to resolve these issues would be to analyze the crystal structure of P206.1 in 2H1. Despite its high affinity, P206.1 behaved like the lower affinity mimetic peptides and did not elicit a strong anti-GXM response in mice when conjugated to various carriers, even though it was able to stimulate a strong anti-peptide response. This result led us to a number of conclusions regarding the search for an effective peptide mimotope of GXM. There is abundant evidence that peptides can serve as mimics and even mimotopes for carbohydrate Ags (42, 43). As reported by Scott et al. (44, 45), there appears to be a difference between a structural mimic and an immunologically functional mimic. We were not searching for a peptide that would mimic the structure of GXM, but, rather, for a peptide that would best mirror the Ag binding pocket of 2H1 and thus serve as a functional mimotope. Because of its high affinity, it is possible that P206.1 can achieve a conformation that is a true mirror image of the 2H1 binding pocket. However, this would have to be a rare conformation, since P206.1 alone elicits high anti-peptide titers, but negligible Ab to GXM. Since peptides are likely to bind Ab through a different set of V region interactions than does the native carbohydrate Ag (29, 46), we did not expect these peptides to be structural mimics of GXM. This is true of the anti-GXM family of Abs, since a single amino acid change in the VH CDRs is sufficient to alter the Ab specificity for the peptides used here, whereas such differences are not sufficient to alter the Ab specificity to GXM (37). This has been further illustrated by the binding of our peptides to a panel of anti-GXM mAbs (Fig. 4⇑). These Abs have all undergone somatic mutation, and the different amino acid point mutations in their CDRs (35) probably contribute to the differences in binding characteristics to peptides P206.1, P206N, and P206C. Since these Abs retain binding to GXM, GXM and the peptides are probably reacting with a different set of amino acid residues in the 2H1 binding site. This dissociation between Ab binding to a peptide vs a carbohydrate has serious implications in the search for peptide mimotopes of carbohydrate Ags; when isolating a higher affinity peptide, one selects for interactions with the Ab paratope that may be very different from the carbohydrate-Ab interactions. This is, in fact, what we observed with P206.1. Since the response to GXM is highly restricted, and all of the anti-GXM mAbs we have identified have somatic mutations (28), we hypothesized that P206.1 was not eliciting an anti-GXM response because at any given time there were not sufficient B cells expressing a surface Ab that cross-reacted with P206.1 and GXM. In retrospect, this is not surprising, since 2H1 has undergone somatic mutation and affinity maturation (28), and these amino acid differences are likely to form a paratope that differs significantly from that formed by the canonical anti-GXM germline VH7183 and Vκ5.1 genes expressed on the surface of naive circulating B cells. A peptide that binds to somatically mutated V regions could be restricted in its ability to recognize unmutated anti-GXM Abs. This suggests that the best way to identify an immunologically functional peptide mimotope of GXM that would stimulate naive B cells making 2H1-like Abs to GXM is to screen peptide libraries with an mAb expressing the germline VH7183 and Vκ5.1 genes. This idea is supported by the success of several groups in identifying mimotopes to carbohydrate Ags selected by screening libraries with low affinity IgM or IgA mAbs (47, 48, 49). Although P206.1 was not able to elicit an immune response to GXM from naive mice, we wanted to determine whether this peptide could be used as a means of selectively stimulating B cells producing protective Abs from a diverse anti-GXM B cell repertoire. We therefore immunized mice with a low dose of GXM-TT to expand the pool of memory B cells making both protective and nonprotective anti-GXM Abs. After boosting these mice with P206.1, either alone or attached to various carriers, we found that P206.1-TT stimulated significant anti-GXM titers with the characteristics of a secondary immune response. Furthermore, this anti-GXM response consisted primarily of Abs that, like other protective anti-GXM Abs, did not bind de-O-acetylated GXM, suggesting that the peptide boost had specifically focused the Ab response on a protective epitope. While we have not yet made mAbs from the mice that were primed with GXM-TT and boosted with P206-TT, we have made a few mAbs from mice that were primed with GXM-TT and boosted with P206.1 conjugated to KLH. Two of these mAbs cross-reacted with GXM and P206.1, and both expressed VH7183 and Vκ5.1 (our unpublished data). Even though a different carrier was used to produce these mAbs, this suggests that the serum response described in this paper would also be encoded by the same V region genes that are used by 2H1, like most of the other Abs made in response to GXM-TT (28, 39). The results presented here indicate that evolutionary phage peptide sublibraries can be powerful tools for isolating high affinity peptides. This technique may prove useful in identifying other high affinity peptide-Ab interactions for use as biochemical, diagnostic, and therapeutic reagents. The evolutionary sublibrary technique we have employed may also be effective in isolating high affinity peptides involved in other protein-protein interactions (reviewed in Ref. 50). While we did identify a high affinity peptide that discriminates between protective and nonprotective Abs, immunization with this peptide did not lead to significantly higher anti-GXM titers than immunization with the lower affinity parent peptide. However, this high affinity peptide was effective as a secondary immunogen in selectively stimulating those B cells producing Abs to a protective epitope from among a broad pool of B cells primed by a glycoconjugate vaccine known to contain both protective and nonprotective epitopes. Furthermore, our results suggest that if we primed with a peptide that reacted with germline-encoded Abs, a secondary Ab response could then be specifically directed to a protective epitope by immunization with higher affinity peptides obtained from an evolutionary peptide sublibrary such as P206.1. These results have implications for the design of peptide mimotope vaccines to carbohydrate Ags. We thank Jieru Zhang, Jin Oh, and Susan Buhl for technical support. We also thank Drs. Betty Diamond and Arturo Casadevall for helpful comments and critical review of this manuscript. ↵1 This work was supported by grants from the National Institutes of Health (AI 01434 (to D.O.B), T32AG 00194 (to R.M. ), AR4297 and AI43937 (to M.D.S.). M.D.S. was supported by the Harry Eagle Chair provided by the Women’s Division of the Albert Einstein College of Medicine. P.V. was partially supported by The Philippe Foundation. ↵2 D.O.B. and R.J.M. contributed equally to this work. ↵3 Current address: Department of Microbiology, Immunology, and Molecular Genetics, University of California, 609 East Charles Young Drive, MSB 1602G, Los Angeles, CA 90025-1489. ↵4 Current address: Sidney Kimmel Cancer Institute, 10835 Altman Row, San Diego CA 92121. ↵6 Abbreviations used in this paper: TT, tetanus toxoid; CDR, complementarity-determining region; GXM, glucuronoxylomannan; KLH, keyhole limpet hemocyanin; MAP, multiple antigenic peptide. Tunkel, A. R., W. M. Scheld. 1995. Acute meningitis. G. L. Mandell, and J. E. Bennett, and R. Dolin, eds. In Principles and Practice of Infectious Diseases Vol. 1: 831 Churchill Livingstone, New York. Casadevall, A., J. R. Perfect. 1998. Cryptococcus neoformans ASM Press, Washington, D.C.